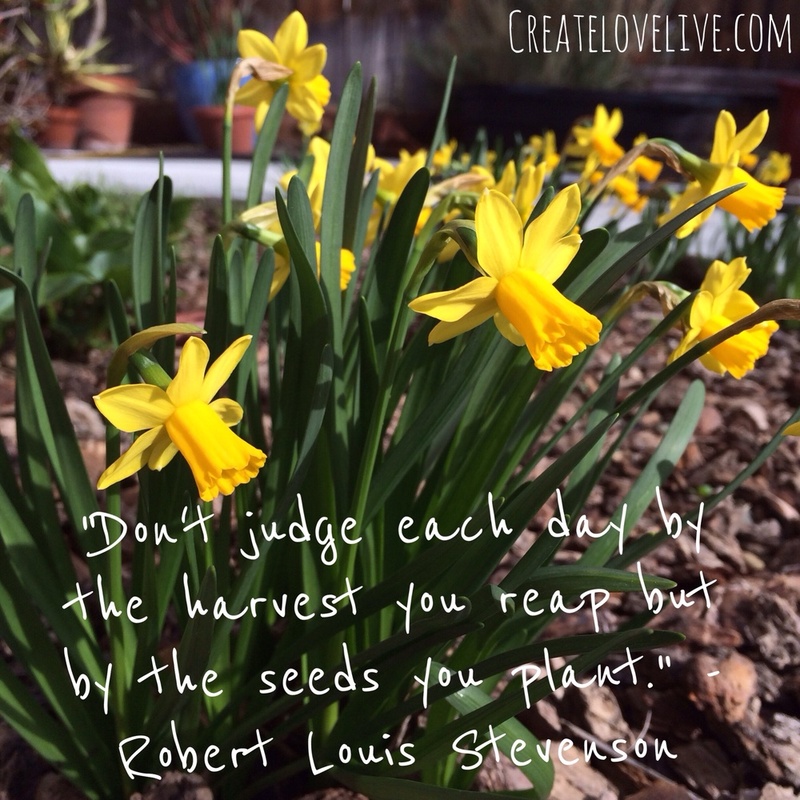 Today I went out in my garden to find a bunch of daffodils blooming unexpectedly in one area of my yard. I was so excited, they are one of my favorite flowers and I've always dreamed of having an area of my yard filled with daffodils. For a moment I thought it was just by chance that the flowers had decided to make my yard their home. Then I remembered that a couple of years ago I came across some daffodil bulbs and on a whim I planted a bunch of them in the ground. Then I forgot. Last year I vaguely remember getting two or three small flowers and being somewhat disappointed, then I forgot about them again. This year, the plants have expanded and filled a full area with blooms which bring a smile to my face every time I pass them. It struck me how the seemingly insignificant action of planting some bulbs in the ground a couple of years ago could bring me so much joy today. I was reminded that we all have the opportunity to create our future with the little actions we take every day. The difference is that unlike the clear and obvious outcome of ending up with a gorgeous bed of daffodils, we can't always see the direct connection of our past actions to our current situation. But they are deeply connected. Sometimes you may notice the connection, many times you will not. There are countless actions and interactions you will make today that will seem meaningless or go by barely noticed, that will have a great impact on your future. They are the catalyst for what you create in your life, even when you don't realize it. So today, tomorrow and moving forward walk with your head held high and try to remember that with every choice and action, you are creating your future. With every action you take do your best to choose to create from a loving place. Trust that the more often you choose to create with love, the more love you will see in your future. Have you ever connected a past action to a positive outcome years later and if so, what did you learn from it?